Home » Rollout or Roll Out – What’s the Difference? Sometimes, people use common phrases so often that they become lumped together into a single word. That’s what happened with skyscraper, woodpecker, and breakup. New writers often wonder if it wouldn’t be simpler to leave the words separate. There are some instances where to do so would be appropriate, depending out how you use the phrase in a sentence. Rollout is a great example of this—in some contexts, it should be compounded, and in others, it must be separated into individual words. What is the Difference Between Rollout and Roll Out? In this post, I will compare rollout vs. roll out. I will use each of these words in at least one example sentence, so you can see how they appear in their proper context. Then, I will show you a mnemonic device that makes choosing either rollout or roll out for your own writing a much simpler task. What does rollout mean? Rollout is a noun. A rollout is a systematic introduction of something, like a product line or a brand new airplane. Oftentimes, a rollout will occur in stages, where the top-tier product is introduced first, followed by lower-tier products after the initial excitement has dissipated. When the rollout for Windows 8 was met with widespread derision, Steve Ballmer left Microsoft and bought a basketball team instead. The new company organized a swift, orderly rollout of its products to capture the attention of its consumer base. Apple rolls out its new iPhones at its Worldwide Developers Conference. I will fine-tune the new procedures at a few test sites before rolling them out companywide. The standard rules of compounding in English are at play here. When a phrase is used as a noun, it is often compounded into a single word, like rollout. As a verb, the words are more likely to remain separate, like in the verb equivalent roll out. You can see this with other words like breakdown, buildup, makeup, setup, among others. Occasionally, if the phrase is used as an adjective, it might be hyphenated, to form something like roll-out. Roll out could also mean to unroll something, like a sleeping back or a spool of yarn. Sometimes, it means to leave, like in the phrase Let’s roll out. Which of these variants you use at which times depends upon how they function in your sentence. Both are correct, but one is a verb phrase, while the other is a noun. 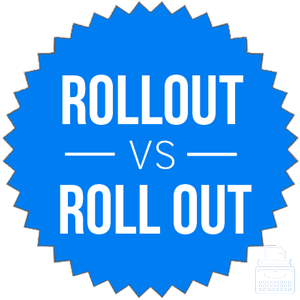 Roll out vs. Rollout Check: Since roll out is a phrase made from two individual words, and roll itself is a verb, it is easy to remember that roll out is a verb phrase. Is it roll out or rollout? The two are not interchangeable, so be sure to use the noun when you need a noun and the verb phrase when you need a verb phrase. Roll out is a verb phrase that means to introduce something, like a new product line. Rollout is a noun that means a product introduction. 1 What is the Difference Between Rollout and Roll Out?